On sale! 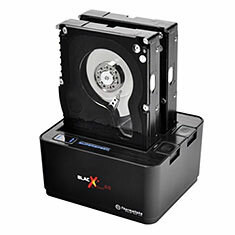 (normally $75) The Thermaltake BlacX supports all 2.5in and 3.5in SATA I/II/III hard drives up to 2TB, and can simultaneously read and write two hard drives at the same time. Blazing-fast USB 3.0 SuperSpeed data transfer - maximum transfer rate of up to 5.0 Gbps. Backward-Compatible with USB 2.0 (Max: 480 Mbps) & USB 1.1 (Max: 12 Mbps). Premium shielded USB 3.0 SuperSpeed cable - corrosion resistant plating & heavy gauge wires for years of reliable use. 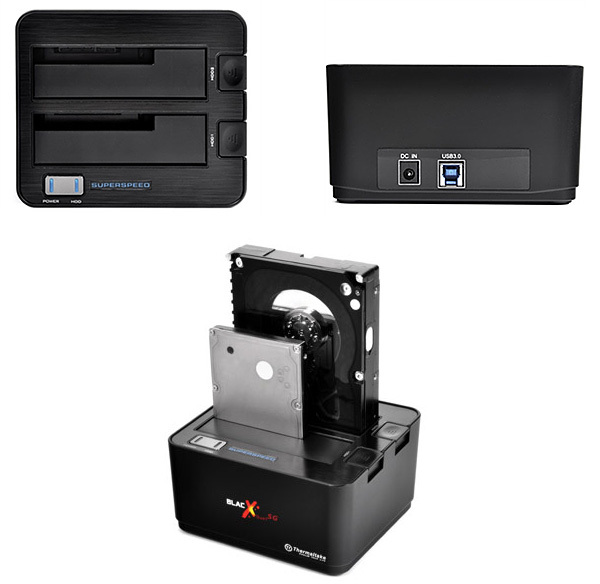 Supports all 2.5in & 3.5in SATA I/II/III hard drives up to 2TB. Simultaneously read and write two hard drives at the same time. Plug&Play Installation - no software needed and ready to work in seconds. Hot-Swap Capability for rapid multi-HDDs access & exchange. Open docking station design maximizes heat dissipation. Windows & Mac OS compatible. Windows 7 32bits & 64bits ready.